Charles Bartholomew purchased the manor and estate of Blakesley, near Towcester, Northamptonshire, in 1876 as a gift for his son, Charles William Bartholomew. When his father died in 1895, Charles William proceeded to spend large portions of his inherited fortune on the estate and village, and was well known as a local benefactor. One of his early ‘improvements’ was to commission James Pulham and Son to construct an ornamental stream – complete with a waterfall, cascade, lagoon, stepping-stones and rustic bridges – in his pleasure grounds. His guests were even able to participate in a quiet afternoon’s punting on the picturesque ‘upper stretch’ of the stream. The seat at Blakesley Hall. There was a message in a bottle hidden inside one of the piers . . . 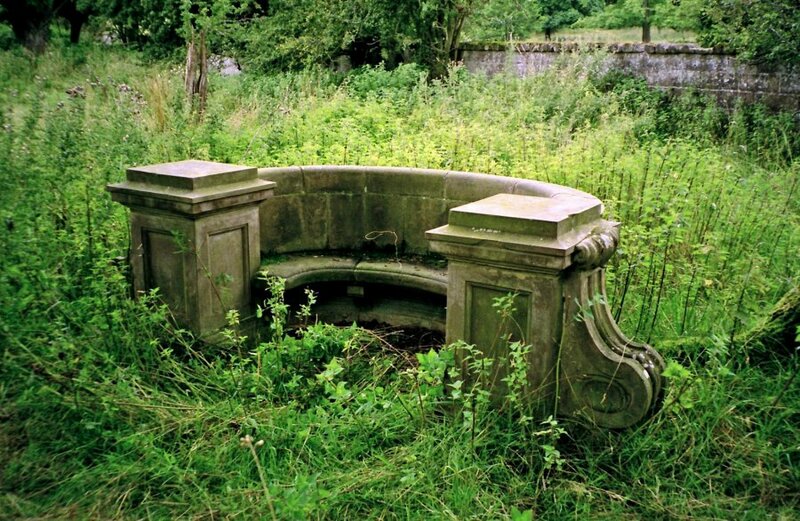 The Pulhams returned in 1907-08 to replace the old wooden bridges over the stream with ornamented stone balustraded bridges, and there is a fascinating story in the book about a message in a bottle being hidden in one of the garden seats . . .
Posted on September 7, 2014 June 27, 2016 by Claude HitchingPosted in Book ContentsTagged 'Message in a bottle . .', . . James Pulham and Son, Balustraded bridge, Blakesley Hall - Northamptonshire, Charles William Bartholomew, Claude Hitching. James Pulham and Son, Ornamental stream, Rock Landscapes: The Pulham Legacy.